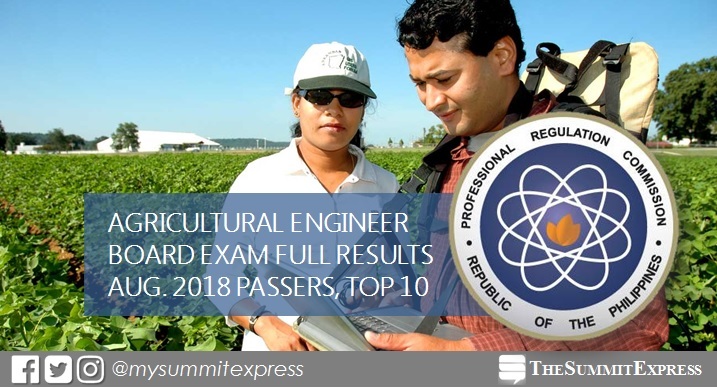 MANILA, Philippines – The August 2018 Agricultural and Biosystems Engineer board exam results, which includes the full list of passers, top 10 (topnotchers), top performing school and performance of schools are all available on this page as officially announced on Tuesday, August 28 or in two (2) working days after the exam. The Professional Regulation Commission (PRC) and the Board of Agricultural Engineering conducted the licensure exam on August 22 and 23 in the cities of Manila, Baguio, Cagayan De Oro, Cebu, Davao, Legaspi & Tuguegarao. The Board of Agricultural Engineering is composed of Engr. Ariodear C. Rico, Chairman and Engr. Juana T. Tapel, Member. As advised, all successful examinees should personally register and sign in the Roster of Registered Professionals. Agricultural Engineer board exam's verification of ratings (passers, non-passers and removal) can be done online. The two-day exam covered the following subjects: rural electrification, agricultural processing, agricultural structures and allied subjects (Day 1); soil and water resources development and conservation, irrigation, drainage and allied subjects, agricultural mechanization, agricultural power, agricultural machinery, equipment and allied subjects (Day 2). In August 2015, results were announced in 4 working days. A total of 340 out of 841 passed the exams. UPLB also topped the board with 89.74-percent passing or 35 out of 39 passed the series of tests. Monitor this page for the real-time updates on Agricultural Engineer board exam results. Check out also the official website of PRC for more information.